Magic involves the suspension of disbelief. We KNOW what we are watching is not possible, but we ignore the logic of it all and just roll with it. Now You See Me comes close to being an entertaining heist picture with twists and turns that work and can be entertaining. I was willing to suspend disbelief throughout much of Now You See Me, but it wasn't until we got to the third act that we got twists that were both predictable and stupid that the film just collapsed for me. Well, at least for the most part it held up. We meet four different types of illusionists: street card shark J. Daniel Atlas (Jesse Eisenberg), disgraced hypnotist Merritt McKinney (Woody Harrelson), escape artist and Atlas' former assistant Henley Reeves (Isla Fisher), and Uri Geller-like magician Jack Wilder (Dave Franco). They are all secretly contacted by a mysterious figure via four tarot cards: Lover, High Priestess, Hermit, and Death respectively. They are brought together to begin a long-term master plan. We go to a year later. They are headliners at the MGM Grand, billed as The Four Horsemen. At one particular show they will perform a daring magic act: they will teleport a man from Vegas to Paris to rob a bank. This they do in front of their patron, billionaire Arthur Tressler (Michael Caine), as well as magic debunker Thaddeus Bradley (Morgan Freeman), the latter surreptitiously videotaping the show. The Four Horsemen appear to do the impossible, for at the time of the act, as euros rain down on the audience, the bank is indeed robbed. This attracts the attention of both FBI Agent Dylan Rhodes (Mark Ruffalo) and INTERPOL rookie Alma Dray (Melanie Laurent). Dylan hates magicians, and as a result, he is extremely displeased to be assigned a case involving "David Copperfield and Friends" and saddled with this rookie. However, because there is no actual evidence against the Four Horsemen tying them to the robbery, they have to be released. Bradley suggests that there is a solution to the crime, but he won't give up anything. He does provide Rhodes with a vital clue, the story of Lionel Shrike, who disappeared after Bradley exposed his tricks and has not been seen since. They might be tied in to a secret society called The Eye. There's only one way to find out: at their next performance in New Orleans. The Four Horsemen perform for a group that has one thing in common: their insurance failed to cover their losses from Hurricane Katrina, but somehow they find their accounts have all earned money...while Tressler's account has shrunk by the same amount. Now an enraged Tressler and infuriated Rhodes attempt to get The Four Horsemen, but are foiled by their tricks. One last chance to grab them in what is touted as their 'farewell' performance in New York. Soon the pieces come together, tying so many threads in more and more ludicrous manners. I can't reveal all, but Lionel Shrike is involved somehow, with the actual brains of the operation being both predictable and unbelievable. While I was more than willing to go along with Now You See Me's plot, when we get to the wild police chase I figured out what was going to happen. It was the only logical solution, but herein lies one of the big problems in Ed Solomon, Boaz Yakin, and Edward Ricourt's screenplay (from a story by Yakin and Ricourt). In order to believe the story we have to accept that too many things that rely on precise planning would go exactly as planned. We start with the idea that these four would end up within a year as Vegas headliners. At first, things were explained (such as the Paris robbery) in a way that make sense. It isn't until what is suppose to be the climatic chase that I thought, 'this wouldn't work'. Not only did I know a character would not be dead, but I also knew that for this plan (apparently twenty years in the planning) to work, EVERYTHING had to go right. That is simply too unbelievable to accept because it leaves absolutely no room for error, and even in the most expertly planned and executed plan something is bound to go wrong. If the raid on Osama bin Laden's compound in Zero Dark Thirty had a couple of errors, how can we expect THIS plan to work without one mistake. Even that perhaps could be accepted if you didn't think about it too much. It is when we find the identity of the mastermind that I thought, 'well, this person is the one who is suppose to give us the 'big twist' but not only did we not get any indication of this but it just is really too stupid to accept'. 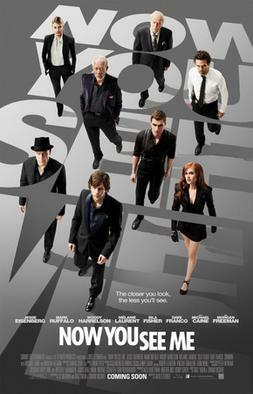 Still, when it comes down to it Now You See Me has a great visual style and some pretty good performances. Louis Leterrier creates a strong visuals to where the film is impressive to look at. All the magic acts, while I imagine not possible in real life (in the MGM Grand scene, a theater that large would make appreciating the show hard to appreciate, even with jumbo screens). 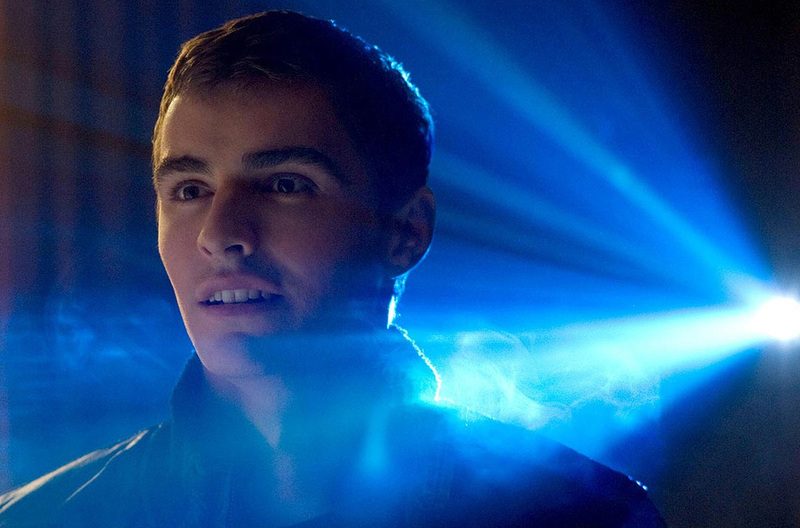 We also got strong performances, particularly from Dave Franco as the youngest member of the Four Horsemen still trying to show he can play with the big boys. Franco's done well in coming out of his brother James' shadow. Ruffalo, who is one of my favorite actors, got saddled with a one-note character but to his credit he does what he can with it and is always fascinating to watch. In the smaller roles both Freeman and Caine showed they can handle thinly drawn characters and make them worth our time. The only (very) sour note is Eisenberg, someone who's career is a complete mystery to me. In every film (even The Social Network) he plays the same character: the smarmy, fast-talking jerk. At one point Hadley says that Atlas' behavior is "not phony arrogance", and the only thing I thought was that that's true: it's Eisenberg's usual modus operandi. He is always the same in every film, and I find him endlessly grating in his persona of the overly confident person who talks really fast but has nothing to back up his ego or anything sensible to say. There were also other elements that didn't work apart from the fact that everything had to go split-second right (thought that is a BIG part of what went wrong with Now You See Me). We get the requisite romance between Dray and Rhodes which we didn't really need, and conversely while we are told there was a romance between Hedley and Atlas it isn't part of the story at all. The film also doesn't give the Four Horsemen or Rhodes or really any of the characters much of a backstory. If it weren't for the fact that the story simply becomes too ridiculous at the end Now You See Me might have been really good and succeeded in what it was trying to do. However, some good performances and visuals lift it up much more than it should have. On the whole, it comes close to pulling off its tricks, but in the end Now You See Me is a rabbit short.